Men’s pole vaulting has been a part of the Olympic Games since the very beginning in 1896; Women joined the fray in 2000. It’s a silly, dangerous sport in which people go very high and often get hurt. Learn more about pole vault before the women’s final tonight at 8:30PM. The Event: The pole vault contains a series of steps, none of which seem especially hard. It’s part sprinting, part jumping, part gymnastics, and part acute spacial awareness with a dash of danger. Other than that, it’s a cinch. The best vaulters do it somewhere between 15-17 feet (the women) and 18-20 feet (the men) in the air. 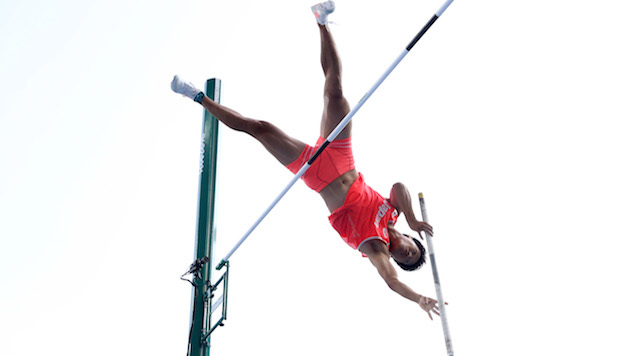 The object is to run at top speed with a long fiberglass pole, which is planted into a small box in the ground as the vaulter jumps toward the mat. Physics and a good firm handgrip bend the pole, which then propels the vaulter into the stratosphere, who then kicks, turns, pushes, and attempts to land safely back on earth. Oh, and you do all this without knocking a lightweight bar from the standards. Simple. Wildcard (literally): A number of great pole vaulters come from gymnastics background because the skills translate appropriate; There’s core strength and upper body strength, and they’re upside down frequently. Pole vaulters are also a bit nuts. They’ll admit it. History: Pole vaulting began as a way for regular pedestrians to cross marshy wetlands without getting wet. Kind of like what many of us did as kids in the woods, but it was Europe, so I assume rather than in gym shorts and t-shirt, it was done in knickers and a top hat. As a sport, it probably began back in the 1820’s in England, when the London Gymnastic Society held measured pole vault events. Modern competitions began in the 1850‘s when the revolutionary German gymnastic outfit the Turners added it to their repertoire. Original poles were bamboo or aluminum. The gamer(s): The best vaulter in the world is France’s Renaud Lavillenie, who owns the world record at 6.16 meters (20 ft. 2 1/2 inches); The reigning women’s gold medalist, America’s Jenn Suhr, will be back to defend her crown in Rio de Janeiro after having cleared 5.03 meters (16 ft. 6 inches) this past winter, just one inch shy of the women’s record. New Generation: Perhaps the most intriguing storyline of the Olympic Games is the youth movement. The women’s pole vault became an Olympic event in Sydney, and the second generation of vaulters is moving in to demand the world’s attention. 10 of the world top 20 jumpers were born after the year 1990, including medal contenders Katerina Stefanidi from Greece and American Sandi Morris. America’s third vaulter, Lexi Weeks, from the University of Arkansas is just 19; Finnish Olympian Wilma Murto just turned 18. The WTF: There is a sport in the Netherlands called fierljeppen, which is the drunk cousin of pole vaulting in which a jumper sprints to a pole (a polsstok), jumping and grabbing it, climbing to the top while trying to carry it forward over a large body of water, and landing on a sand bed on the opposite side. It’s ridiculous. No beer is drank at this. None.